Governor-general of Java, and founder of the Dutch colonial system; born at Hoorn, Holland, Jan. 8, 1587; died in 1629. He gained his early commercial experience with the firm of Piscatori in Rome, went to India on a commercial exploration in 1607, and made a second voyage with two ships in 1612. He was appointed director-general of the Indian trade in 1613. As governor-general of Java, he destroyed (1619) the native town of Jacatra, and founded Batavia, the capital of the Dutch East Indies. He died childless in 1629, and his large possessions went for the benefit of orphans in his native town of Hoorn, subject to a bequest in favor of members of his family, which seems to have been some time later successfully claimed. 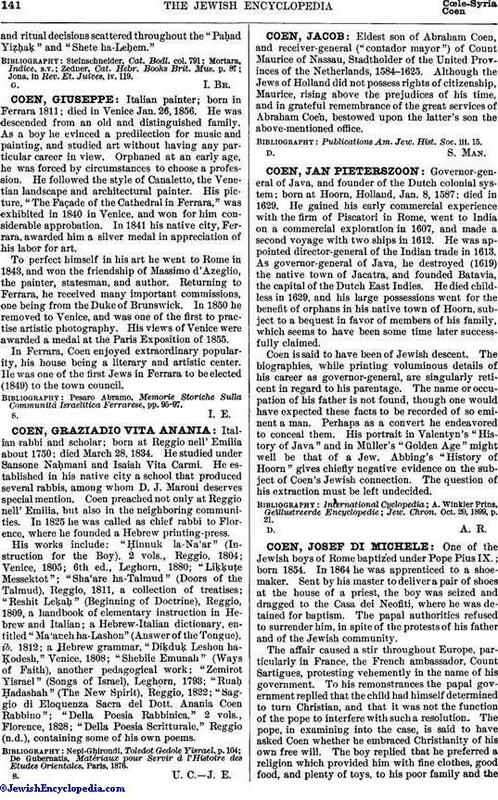 Coen is said to have been of Jewish descent. The biographies, while printing voluminous details of his career as governor-general, are singularly reticent in regard to his parentage. The name or occupation of his father is not found, though one would have expected these facts to be recorded of so eminent a man. Perhaps as a convert he endeavored to conceal them. His portrait in Valentyn's "History of Java" and in Müller's "Golden Age" might well be that of a Jew. Abbing's "History of Hoorn" gives chiefly negative evidence on the subject of Coen's Jewish connection. The question of his extraction must be left undecided. Jew. Chron. Oct. 20, 1899, p. 21.